Classic experiment to demonstrate crossing over. Students will be able to identify genetic differences between diploid and haploid organisms, explain how genetic variability arises from sexual reproduction, and study the roles of mitosis and meiosis. 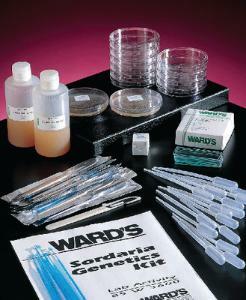 Students will grow wild type, and mutant Sordaria strains on mating agar and examine the ascospores under a microscope (available separately). They will then calculate the distance in map units between the gene for ascospore color and the chromosome centromere. The kit includes a teacher’s guide, student copy master, and enough materials for eight setups. Ordering information: Kit contents include Sordaria mating agar, petri plates, microscope slides, coverslips, sterile scalpels, disposable pipets, disposable inoculating loops, and redemption coupon for 1 Sordaria fimicola plate, wild type, 1 Sordaria fimicola plate, tan mutant. Materials needed but not supplied are a compound microscope and incubator.